Great Smoky Mountains National Park spans more than 800 square miles across two states, Tennessee and North Carolina. With only 5 1/2 days to explore the Park, where do you start? For many visitors, including my friend Don and me, you start at Cades Cove. 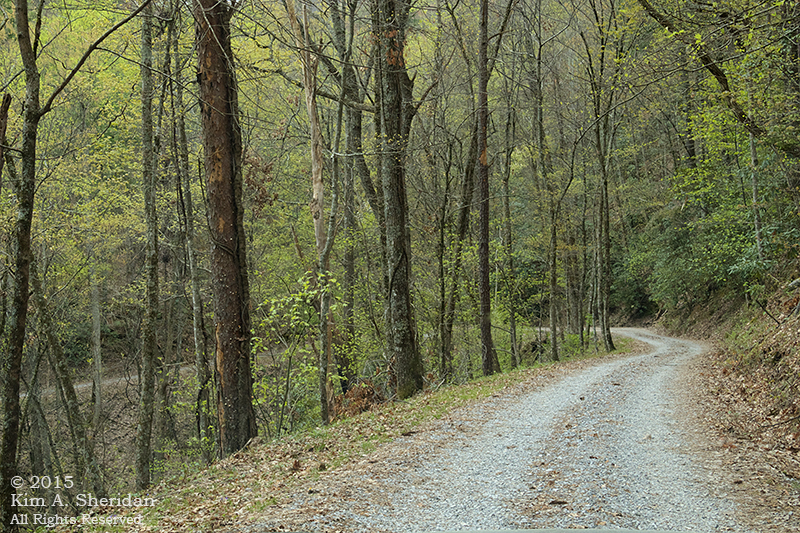 Scenery, wildlife and history – Cades Cove has it all, in one 11-mile driving loop. That’s where we spent our first full day at the Park. We arrived at the Cove early on a nice morning with blue skies. It would be the last rain-free day we had for a week. A “cove”, by the way, is Smoky Mountain parlance for a flat valley between mountain ridges. 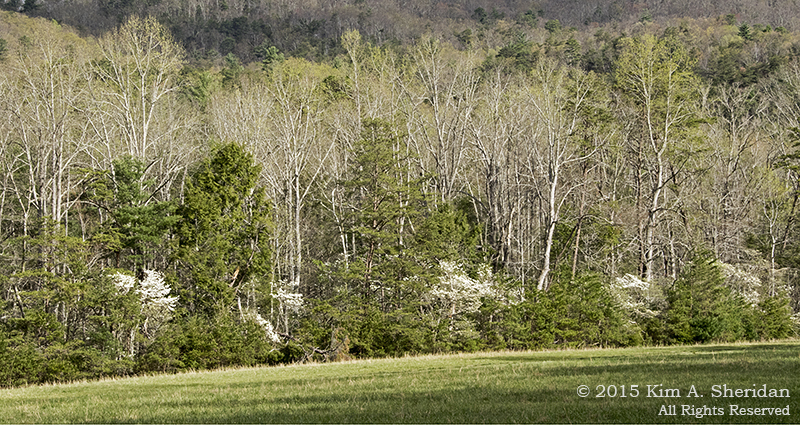 At Cades Cove, the overlying rock has eroded to expose a valley of limestone. Meadow grasses and plants thrive on limestone soil. 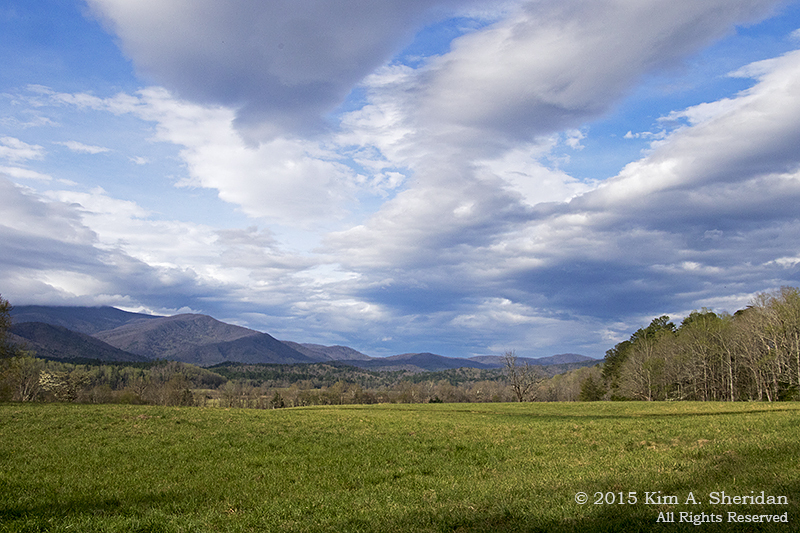 While some of Cades Cove is wooded, much of it is open, making for some great views of the mountains beyond. In the five hours we spent there, I never got tired of those mountains. Click for the full effect. There was a lot more to see than just mountains and meadows though. Wildflowers abound, and we saw some interesting wildlife. We also got a real sense of the history of the place. 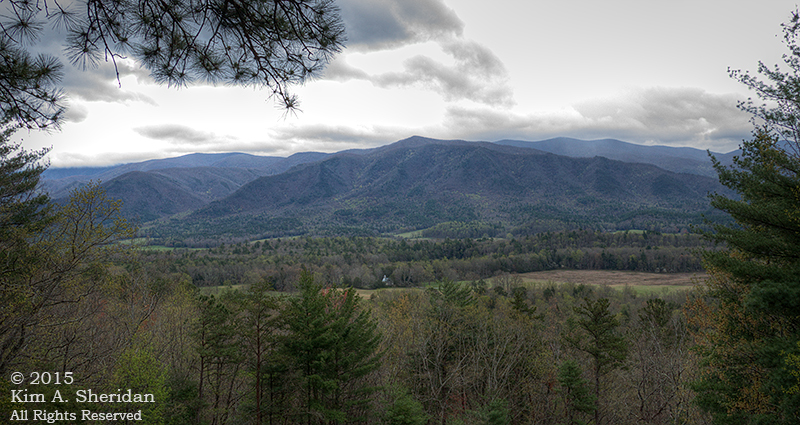 Cades Cove was first used by the native Cherokee who hunted deer, elk, bison and bears. The first white settler arrived in this idyllic place before 1820, finding fertile soil and abundant game. A self-sufficient community flourished here for generations, with grist mills, blacksmiths, distillers, stores, churches and schools. 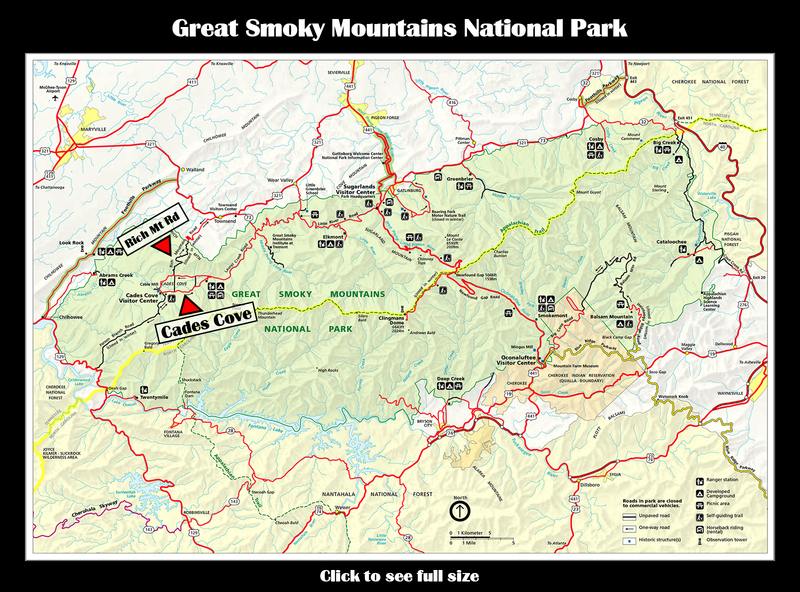 Since the establishment of Great Smoky Mountains National Park in 1934, the area has been maintained as an historic district. Some of the original buildings are still in place, and we stopped to explore them as we drove the loop road. 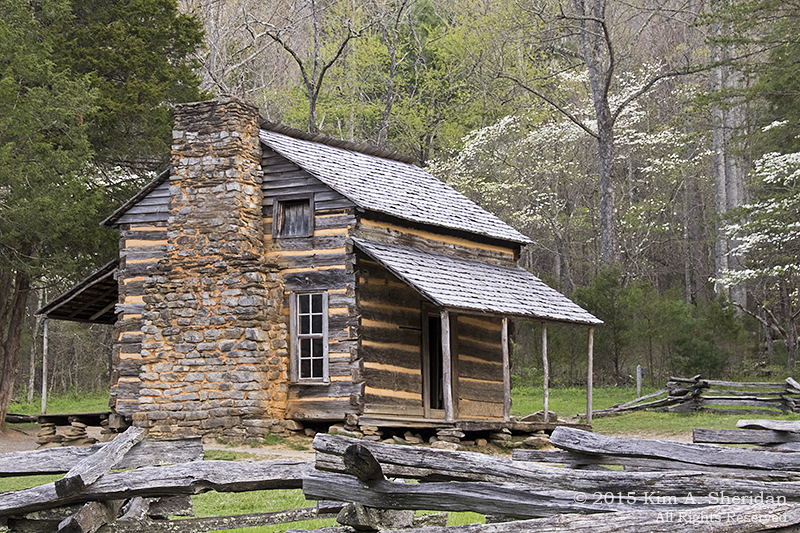 The cabin above was the home of John Oliver, the one of the first settlers of Cades Cove. It’s a simple one-room log cabin, with doors on three sides and a loft above. The people of the cove were religious folk. We came to three churches in succession, two Baptist and one Methodist. The Baptists argued over missionary activities and split into two churches; the Methodists argued over Civil War loyalties, and likewise split, although Hopewell Methodist Church no longer stands. All three churches are spare white frame buildings with a bell tower on top. Inside are rows of pews, and a pulpit. Outside each church is a graveyard, which gave Don and me a change to indulge our interest reading old tombstones. Here Olivers, Tiptons, Shieldses and Cables abound. Many young children were buried in these graves, some too young to even have names. 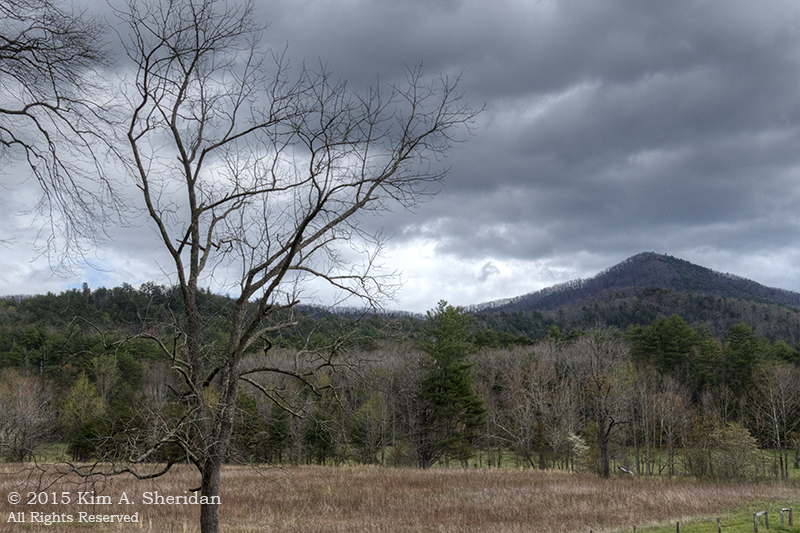 Life could be harsh in Cades Cove. The Cable Mill area is a complex of historic buildings. 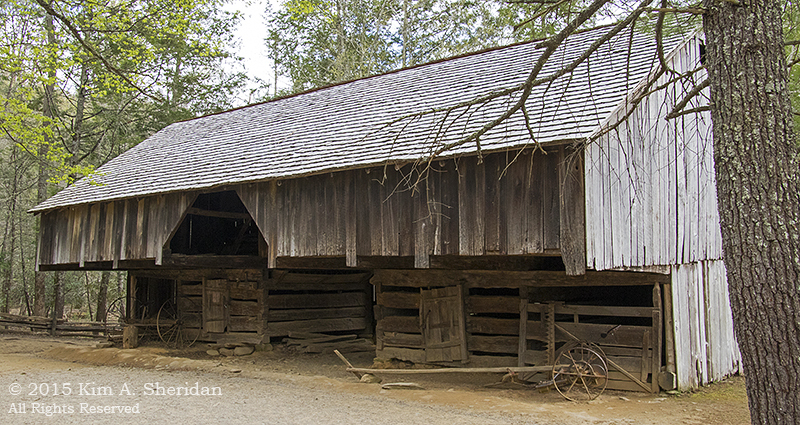 This is a cantilever barn, a typical type of construction in the cove. 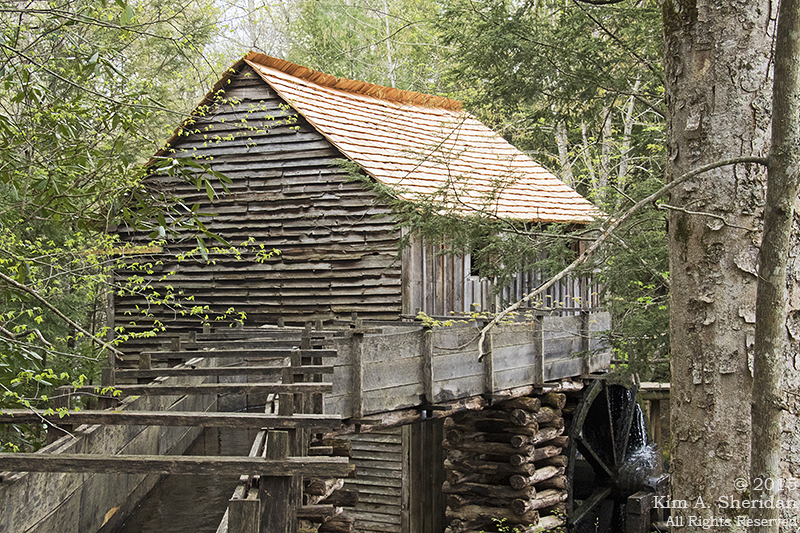 John Cable built and operated a grist mill in 1870. Its large mill wheel and mill race are still functional. Inside, you can see corn being ground and even purchase a small bag of flour. After circling the cove, we decided to take the adventurous route home. 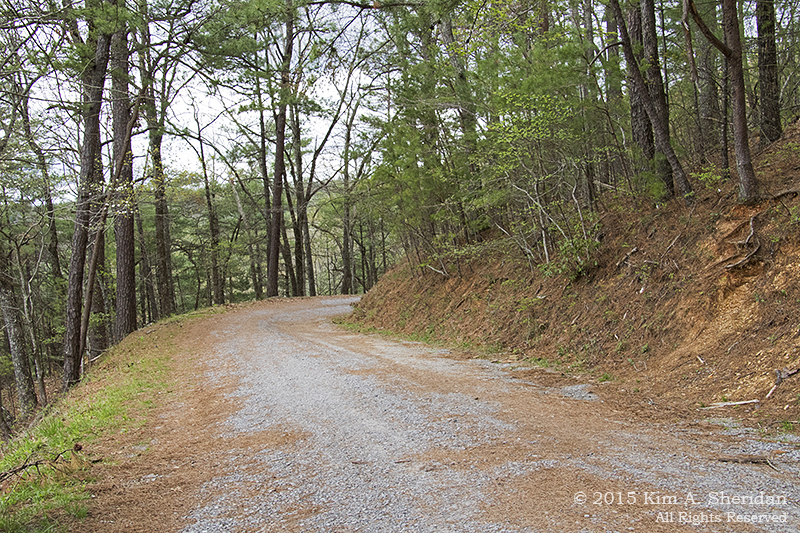 We drove Rich Mountain Rd, a one-way gravel road that runs up to the top of Rich Mountain, then descends out of the Park into Tuckaleechee Cove. It was a lot of fun winding around the endless twists and turns. Mother Nature’s roller coaster! 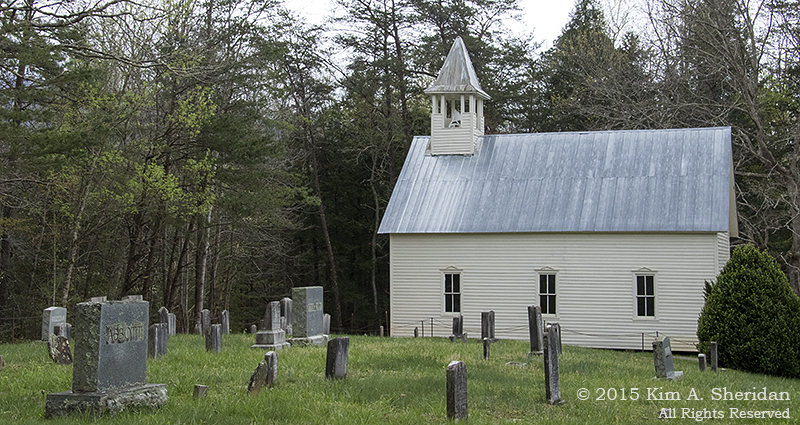 Along the road was an overlook with a fantastic view of Cades Cove and one of the churches. Click to see full size and find the church. Here’s one of many switchbacks on the descent. I had to learn how to use low gear on my car’s automatic transmission for this trip! 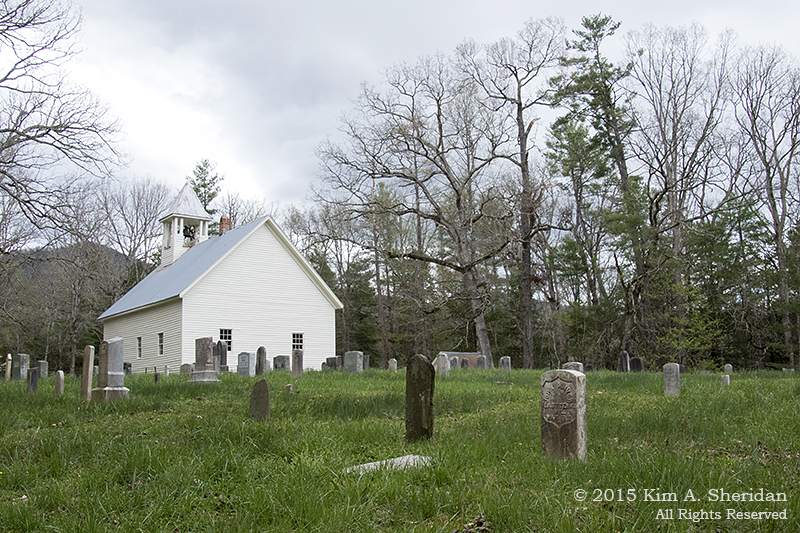 History, dramatic scenery, wildlife – yes, Cades Cove has it all. Wait, what about that wildlife? That, my friends is a tale for another day. This entry was posted in Appalachian Mountains, History, Nature and tagged Great Smoky Mountains National Park, History, Nature by Kim. Bookmark the permalink. I recently discovered your blog and enjoyed the virtual tour of Cades Cove this morning over breakfast. I haven’t been in the Smokies since the late 80s. More recently my family and I vacationed in the Blue Ridge Mtns, so I can definitely relate to the switchbacks, and the drama of cloud banks rolling in over the mountains. Interesting to learn another meaning of the word cove (love the sound of Tuckaleechee Cove!). The cantilevered barn seems to be defying gravity; makes you wonder how anyone ever dreamed up that type of design. Tuckaleechee, Oconaluftee, Cataloochee…Smoky Mountain places names have their own musical charm, don’t they? Thanks for stopping by!